New York Fashion Week Fall 2018 just wrapped up and with it’s conclusion comes the forecasting of next season’s trends. From colorful furry coats to shoulder-sweeping earrings, there were several recurring fashions that came down multiple designer runways. Here, FEMAIL highlights the top fifteen. Get a pen and paper ready. 1. 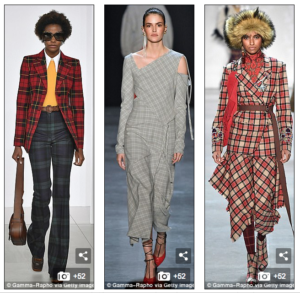 PLAID LIKE YOU’VE NEVER SEEN IT: Tartan fabrics are commonly used to create classic, everyday garments, but this week we admired fresh iterations of the checked print thanks to designers like Prabal Gurung, Vivienne Tam and Jonathan Simkhai.